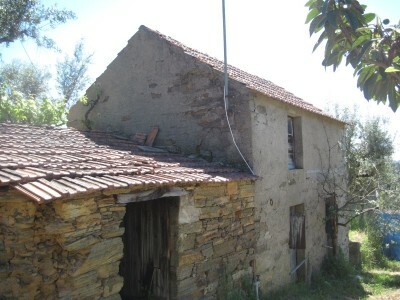 Two stone buildings with a total footprint of 127 square meters sat on a plot of fertile land measuring 8.000 square meters for sale near Cernache do Bonjardim. Both of these buildings are built in stone and consist of ground floor and first floor and both are in good structural condition. Mains electricity is connected and there is a large well to supply water to the buildings and for irrigation purposes. The water is pumped into a 5.000 litre deposit and water supply works by gravity. Mains water is just on the lane next to the property.The larger building was formerly used as an “adega”, a wine cellar and there is a covered open storage next to it. The smaller building was used as storage for agricultural produce. Between the two buildings there is a large xisto stone threshing area. The large plot of land is very fertile and boasts a large number of cork oaks and old olive trees and a vast variety of mature fruit trees. The land is on large terraces and slopes into a small valley and up again. To the bottom there is a large flat meadow and to the far side of the land there is a mixed forest with pine trees and cork oaks and arbutus bushes. The property would be ideal to keep horses, sheep or goats. The houses are located in the urban part of the hamlet, so that planning permission to convert them into a family home would easily be granted. The property is located on the outskirts of Nesperal, some five km from the town of Cernache do Bonjardim, which has cafés, bars, shops, mini-market, pharmacy and schools. The larger town of Sertã is six km away. Sertã has several supermarkets, shops, restaurants, banks, indoor and outdoor pools, a public library, schools, health centres, café bars, parks and municipal buildings and is easy to access off the IC8 dual carriageway . The closest airport to the property is situated at Lisbon, which is around two hours and fifteen minutes drive. Lisbon airport is serviced by a variety of low cost airlines, which operate regulars flights to and from the United Kingdom and other Europe countries.